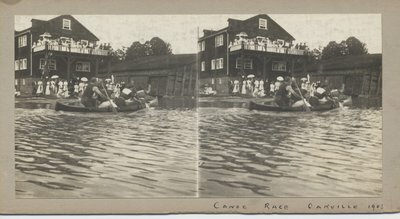 Unpublished stereoviews of the final leg of a canoe race on Sixteen Mile Creek in Oakville in 1908. A crowd of onlookers watch from the shore, both at water level and from a balcony. This appears to be a coed, four person race with two women paddling in the bow.